We often debate on the best time of the day for studying and some have said that early birds do manage to get the metaphorical worm. However, scientific studies have shown that the human mind is at its most creative late at night. Indeed, many people do find it easier to concentrate after sundown when the surrounding decibel level has decreased considerably. It is therefore a good life hack to know how to study at night. Just ask the college students; late nights can be terribly productive if you wish it so! Okay, this is important. No one survives late night study sessions without the right fuel. Eating sugary snacks might pull you through one, but your body isn't going to last much longer if you keep putting in the wrong stuff to keep it awake. Small and healthy doses of caffeine have been shown to increase focus and learning power through the night. But don't go overboard! Also, go for protein-rich foods over glucose. Late night studying is all about focus and productivity. There is no point staying awake if you don't get any work done. The latter is a distinct possibility if you have a habit of keeping your work-desk messed up. Get rid of the clutter on your table and arrange everything neatly. This will reflect on your mind as well which will be more focussed and organized: perfect for working through the night. Continuous studying through the night isn't going to do you much good. If anything, it ends up being a waste of sleeping time: exactly what you don't want. Try taking a short 10-minute break every hour. This will not only help reduce fatigue but will also increase your durability and you'll be able to make better use of the night. It might seem like a waste of 10 precious minutes, especially during finals week, but 10 minutes sacrificed for 50 minutes of more concentrated study isn't too bad a deal. It might seem like a good idea to get onto the bed and get comfy, but trust me, it's not. It'll be good for just about the first 10 minutes and then you will start to get drowsy. 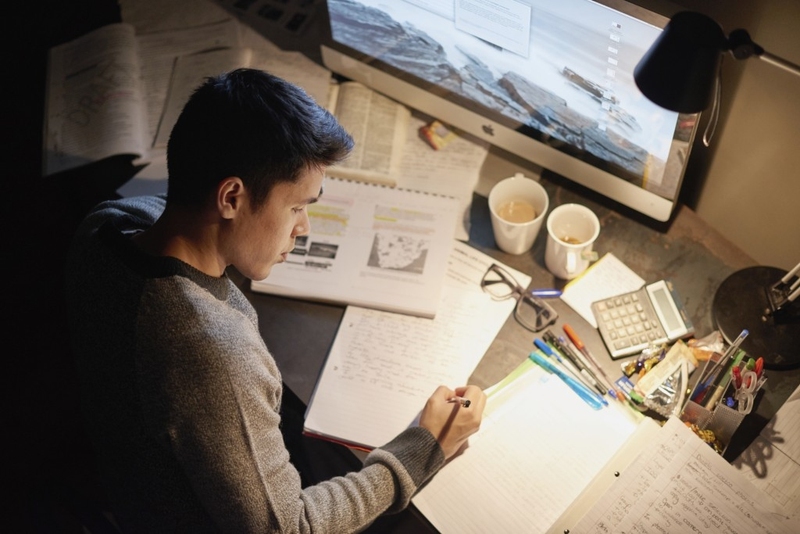 This is a huge red flag when it comes to knowing how to study at night! Stay away from the bed at all costs. You don't need another thing to make you feel sleepy; you have your study-work for that already! So you might be seeing a recurring pattern emerging here. Heavy meals right before bedtime increase the likelihood of your falling asleep. It is no secret that heavy meals have an effect of making you drowsy and that is exactly what you don't need before a late night study session. Try snacking light but healthy. Also, snack intermittently during those 10-minute breaks. This will make your mind occupied and your body charged up. This might be hard considering the fact that most of us need our laptops for studying and our phones to call up our friends to ask what to study! However, a good way to implement this step is to download all the material and keep your PC off the Wi-Fi. Same goes for the phone. As most of the distractions due to gadgets come because of an internet connection, eliminating the root of the problem will definitely help you put in a good study night. This serves a double purpose. The first and the most obvious is to ensure that you keep yourself awake and don't fall asleep. The second one is to remind you of how much time has passed since you started and is a good marker to measure your productivity. That irritating sound will force you stay awake even if you don't want to, and once you are, you might as well get some work done! It has been confirmed that taking notes engages the brain more than just reading through the material. While studying through, it is a good idea to keep a notebook and pen handy to make little notes now and then. This will not just help you understand the material better but will also make sure that you would have actually learned something by the time the night is over. Highlighting text also helps serve the same purpose. Not only should you stay off the bed, but it is a good idea to keep moving your study place from one to another. Again, it is all about activity. Staying at one place will eventually cause your mind to stagnate and that in turn will induce sleep and shatter your focus. After every hour or couple of hours (as you see fit), keep changing your location. This will preserve the mental orientation you started with. A good tip when it comes to knowing how to study at night is that of the power nap. Every college senior worth his salt knows the “power” of these naps. Power naps usually last 20 to 25 minutes. However, their effect cannot be ignored. Just switching off for such short times gets the brain fresh and receptive to new material. Make sure to not fall asleep though! Set an alarm before you power nap just in case. Okay, so I should probably clear this up. I wouldn't suggest anything as extreme as metal but just some soft ambient music that would help keep you awake but not distract you at the same time. You want to be able to concentrate and not get carried away by the music. Personally, I have a habit of switching on Mozart every time before finals week. It's not boring but it's not very loud and attention-demanding either. Plus it helps me focus better. So there you go, choose wisely! This is for you if you study in groups and then repent over getting no work done through the night. Study groups work really well when every person actually knows how to study at night. But it can backfire pretty badly if you study with the wrong company. It will lead to a lot of time getting wasted and above all, deprive you of precious sleep. Server responsed at: 04/20/2019 6:34 p.m.